Russia has annexed Crimea. Russian separatists in the Ukraine have shot down a Malaysian airliner killing nearly 300 on board. Hamas has fired thousands of rockets into Israel and Israel has now invaded Gaza. Islamic radicals have seized large parts of Iraq and Syria and threaten to seize more. In the U.S. thousands of illegal men, women, and now children have entered in violation of U.S. law, and those who have been charged with enforcing the laws will not! Iran continues on its seemingly inexorable march toward obtaining nuclear weapons. Libya has become increasingly anti-American and the American Embassy has been closed. In America there is an exponential increase in immorality and ungodliness, and in some cases actual promotion of ungodliness. 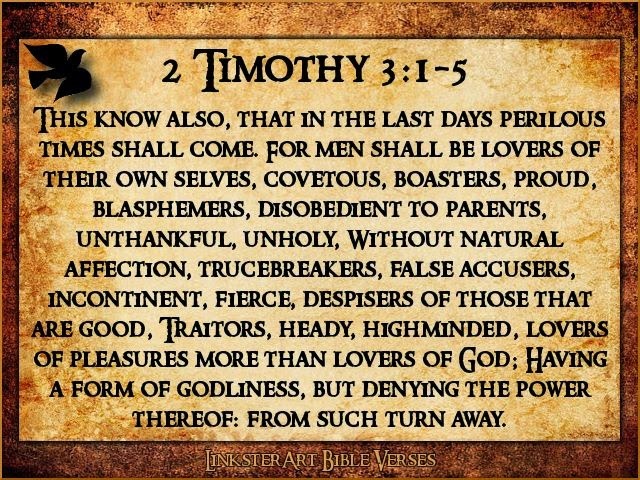 There is also blasphemy, disobedience of law, and even disobedience of parents, despisers of good, and promotion of sexual immorality, homosexuality, and violence. Many call evil good and good evil! The love of pleasure and rise of pleasure seeking even to the complete disobedience of God among those who actually know better has increased substantially. We live in perilous times! There are those who profess to be “leaders” in the Christian church, who deny Jesus is “the way, the truth, and the life”. They deny the great doctrine of substitutionary atonement. They deny that God created the heavens and the earth in six days and on the seventh day rested. They deny that God destroyed the world because of sin and saved Noah and Shem, Ham and Japheth and their wives. Such positions undermine the sublime authority of God’s Holy Word. The overwhelming weight of irresistible evidence supports the Biblical doctrine of Creation, substitutionary atonement, and salvation by faith as a sheer gift of God in the Lord Jesus Christ—Exclusively! The fossil record is not contrary to, but actually supports the Biblical doctrine of the global flood. The discovery of the DNA code supports the Biblical account of Creation and actually destroys the myth of Darwinian evolution. So—why aren’t more people coming to Christ? Because faith comes by hearing the Word of God, specifically it is the glorious Gospel of Jesus Christ that is the “power of God unto salvation”. Moreover, no person can ­­come to Christ except the Father draw that person to Christ. The simple fact is that what keeps people from Jesus is neither a lack of truth nor a lack of reliable evidence – but a lack of willingness! Jesus said “you will not come unto me that you may have life” (John 5:24). Why will they not come? Because men (mankind) love darkness more then they love light (truth) because their deeds are evil! What are we to do? Is there anything we can do? Yes, resoundingly yes! Fourth—Confess with your mouth the Lord Jesus and believe in your heart that God has raised Him from the dead and you will be saved. Don’t be discouraged by the events and circumstances of our day. A brief look at the Holy Scripture shows us clearly that all of these things will come to pass. Therefore, fear not, take heart, Christ will come again and receive us unto Himself. Is His return imminent? Only the Father knows. We want to be faithful, on the job, making disciples. Jesus said to his disciples: “Take heed that no one deceives you. For many will come in My name, saying ‘I am Christ,’ and will deceive many. And you will hear of wars and rumors of wars. See that you are not troubled; for all these things must come to pass but the end is not yet. For nation will rise against nation, and kingdom against kingdom. And there will be famines, pestilences, and earthquakes in various places. All these are the beginning of sorrows. After telling the disciples of the “abomination of desolation, spoken of by Daniel the prophet, standing in the holy place” Jesus says “then there will be great tribulation…” Jesus continues His account of the sign of His coming and of the end of the Age. Notice that the question was “when will these things be” and what will be the sign of your coming?” Notice also that Jesus is the personification of TRUTH and it is He who is speaking. “Then the lord saw that the wickedness of man was great in the earth, and that every intent of the thoughts of his heart was only evil continually.” In verse 13 the authentic holy truth of God’s word reveals that… “the earth is filled with violence through them…” This is the authentic description by Jesus of Noah and his day. 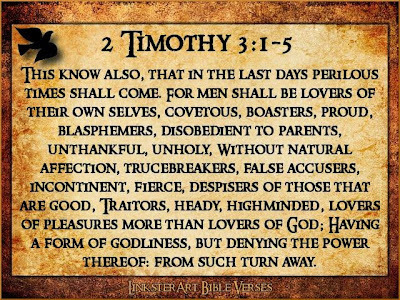 Jesus gives this description while pointing out to his disciples that only the Father knows the day and hour of the [second] coming of the Son of Man, so that they (&we) can “take Heed” that no one deceives them (&us)! Take Heed! How can one take heed if he does not believe that the Genesis account of the flood is true? Jesus says it is true! Who is that person who dares to argue with our creator, redeemer and teacher? Avoid those that tell you God’s Holy Word is not true, especially if they tell you that science has proved that the Word of God is not true, they will lie about other things also! WHAT ARE WE TO BE DOING? Believing that these events have to be fulfilled before Christ returns and, at the same time, being watchful are not contradictory. Jesus has spoken of certain events which must be fulfilled…such as the Gospel being preached to all the world, the tribulation and the cosmological disturbances. Paul speaks of a number of other events which must take place before Christ returns. It is, as John Murray points out, Paul mentions the conversion of Israel (Rom. 11), as one thing that must take place prior to Christ’s return. Murray says, “The collective restoration of Israel does not require the conversion at a future date of all Jews any more than did the rejection mean the apostasy and reprobation of every Israelite. But it surely must imply the widespread acceptance of Jesus as Messiah and entrance into the church of Christ.” This must happen before Christ returns, so says Paul and Murray as he interprets Paul. And, of course, apart from His coming, you never know when you are going to meet Him! You never know when death may take you – maybe as you leave this place today or even as you sit here. What is the thrust of this passage? The need for watchfulness and preparedness. Someone has said that the Christian’s motto ought to be: “To Live as if Christ died yesterday; as if He rose this morning; as if He is coming tomorrow.” The Christian should have that attitude of heart. Another thing this passage says is that we are to examine our lives. Am I being watchful? Does my life evidence this fruit which is the indication of a real and genuine walk with the Lord? Is there any way in which I am secretly saying to myself, “My Lord delayeth His coming. Let me indulge myself a little”? Finally, it raises the questions: Have I made a genuine commitment to Jesus Christ? Have I really surrendered my will to Him in repentance? Have I really put my trust in Him? If you have not done that, why not right now commit your life to Jesus Christ?